The return of GKE 68 to an operational vehicle can be regarded as having three phases. The first, from 1960 to the early 1980s began with a period of enthusiastic attention to repair the ravages of roundly 20 years of passenger-carrying work, but which faded with difficulties over storage and a loss of control over the vehicle's future. There then followed a period of dormancy until the second phase, beginning with Roger Burdett's takeover of the vehicle in the early noughties and extending to the Friends' HLF award in 2013. The third phase, which with due focus should finally see a full restoration, is now under way. Photographs recording the work done since ownership of the bus passed to the Friends of Chatham traction can be seen here. 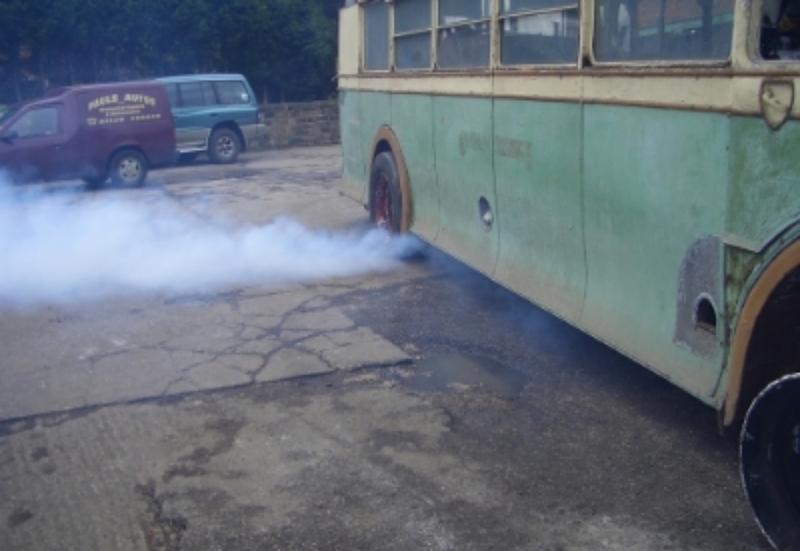 GKE's early years in preservation saw valiant efforts to make the vehicle presentable for use on enthusiasts' tours, together with some maintenance work aimed at attaining the bus's first MoT certificate, achieved in July 1962. Some re-panelling was done (using surplus material from another local operator!) and leaks in roof and windows dealt with. 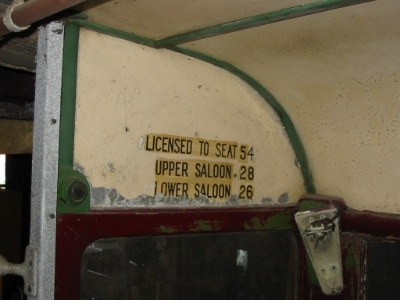 After its rescue by the British Bus Preservation Group, the subsequent transfers to Staffordshire and Barnsley gave opportunities to size up the task of restoration. Roger Burdett described the bodywork as "a basket case" but acknowledged that the bus was still complete, which after so long and so many moves between locations was quite a plus. Once at Barnsley, Paul Winter undertook sufficient work to allow the bus to move around his yard under its own power - the engine was run, brakes freed off, etc. The move of the bus to Aylesford was initially simply for storage, as the bus at that point still belonged to Paul. However with the formation of the Friends and the initial grant from the Awards for All scheme in the bank we began to kit ourselves out. A new fence for our allocated space in Nu-Venture's garage and a nicely painted floor (thanks to volunteer Rob Murray) were a good start. Ownership of GKE passed to the Friends in November 2009. Whilst our fundraising strategy was being developed work on the bus began with a full examination of the lower deck body structure, followed by the replacement of the main lower deck pillars. This work was all done by Rob Murray and Brian Missons, under the guidance of Ian Marsh. A grant from the Rochester Bridge Trust part-funded a complete overhaul of GKE's Gardner 5LW engine. This was undertaken by Ray Harrison at Chartham, using Ray's 40-year expertise as a life-long Gardner employee, and some of the former company's special equipment. The award from the Heritage Lottery Fund in 2013 changed the game completely. We could now pay someone to progress the restoration at a predictable rate and employ someone to monitor progress and costs whilst ensuring a restoration which meets the Friends' requirements. 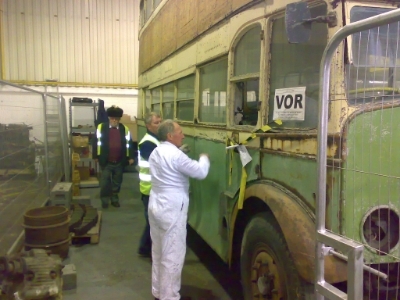 After six years at Nu-venture Aylesford garage the bus was moved to New Romney for restoration of the body structure by Roy Gould, our man on the spot being Chris Gibbons. This third phase of the restoration will be reported through the News section of this updated website and the other media now available to us.